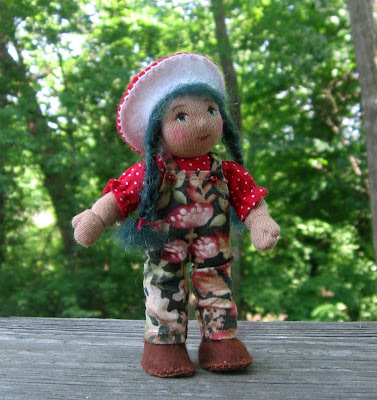 The Fairies Nest - OOAK Cloth Dolls & Fiber Fantasies: Attack of the Shroom People! Attack of the Shroom People! The top one was made especially for a "a gentle 2 year old bossypants" so I had to figure out a way around the polymer clay shoes. I extended the leg wires into feet and gave her sewn on booties and then was totally amazed that she could still stand...hooray for solutions that work! Now all this mushroom stuff got me thinking of the book, The Wonderful Flight to the Mushroom Planet....somehow most of my thoughts seem to lead to books...can you say "AVID Reader!" Anyway, my youngest brought this book home for me to read him years ago and immediately I thought "this looks like a bad B science fiction movie...Yuck!" But after putting it off for as long as possible, I was finally roped into an evening read...and what a surprise! This was such a sweet and gentle book with a wonderful story about a chicken, a rocket, a rescue adventure on a nearby planet, and two boys who love science. Written in the 1950's, so some of the science is a little retro, this is still a lovely children's book that I would highly recommend ... and here is where I come clean and admit that, yes, I did a stint as an elementary school librarian. Can you tell? I LOVE her, she is totally awesome. Wow, she is super cute! 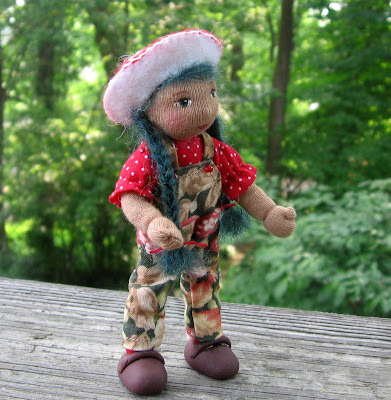 I Love your waldorf dolls. All of them are awesome. Great details and color choices. They are soooo adorable! She's ADORABLE!!! Wonderful artistry. Just makes you want to cuddle her up. What a beautiful doll..She is so sweet looking. gorgeous! I love her 'shroom' head! Super sweet! Thinking we need one in the Christmas stocking this year! 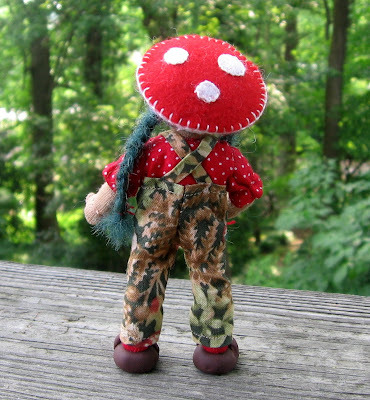 the shroom people rule! i did a small animation called " mushroom girl" it was pretty cute! i love your work! The mushroom top hat is the sweetest! Okay, where can I get one of those mushroom "caps" for myself??. That's one stylin' hat. Fabulous as always!